Groups > Persecuted Christians > Discussions > Topic: CHRISTIANS BOOKS/ CHRISTIAN MOVIES/ LITERATURE! Topic: CHRISTIANS BOOKS/ CHRISTIAN MOVIES/ LITERATURE! This movie isn't exactly about persecution but it is worth watching. For every bad movie, there is one that is truly good and inspirational. August Rush is one of those movies. This movie portrays this dark world and how God can can intervene in a truly miraculous way. I don't know if this movie is true but I wouldn't be surprised if it was. It is also a really good movie if you are concerned about the homeless and children who are mistreated. This movie does not actually say anywhere in it that it is a Christian movie, but all you have to do is watch for certain subtle but obvious hints, and you will know in your heart that it is, especially at the end. Watch the movie and see if you agree with me! If you only watch one movie this year, watch August Rush! I rarely make it through a whole book because of my busy schedule with school; however, this book is hard to put down! This book is very intense and somewhat graphic in explanations, but you will hang onto every word! This book takes place in Russia and Romania and takes us back to the days of communism when Christians were arrested and tortured. If you ever had your doubts of the "Voice of the Martyrs", you won't after reading this book. To view this offer online, click here. This is the busiest time of the year for the wonderful people who work in the VOM mail shop. Each month they package and send hundreds of thousands of newsletters to our faithful readers who read those newsletters, pray for and minister to our persecuted brothers and sisters. During the insertion process for our November newsletter, some newsletter envelopes went out without the special year-end resource supplement. These books and materials assist you to learn and tell the stories of the persecuted church. Rather than wait another month before many of you see these resourceswith special year-end prices and new productsI wanted to get them to you electronically. Please CLICK HERE to see the products featured in the November newsletter. You can review each product on this page, and then link directly to our online bookstore to place your order. Or if you prefer, you can use the order card included with your newsletter or order by phone by calling toll free, 1-800-747-0085. One of the products featured is VOMs 2009 Prayer Calendar, which will help you (or those on your Christmas gift list) pray for the persecuted church throughout the year. » View and order your prayer calendar and other items. THE Voice of the Martyrs has a booklet that is free. A sample chapter of the book "Desperate for God." This is a great booklet and I would love to read the book. To obtain the free booklet with a sample chapter, or to buy the book contact VOM at www.VOMbooks.com or 1-(800) 747-0085. A challenge from the heart. "Your book stirred me to tears and drove me to prayer!" "Only the Bible has had a greater impact on my life." 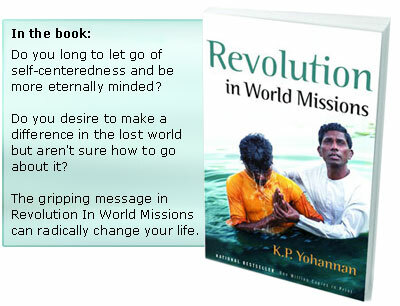 About the book: Revolution In World Missions In this exciting and fast moving narrative, K.P. Yohannan shares how God brought him from his remote Indian village to become the founder of Gospel For Asia. A riveting true story of the church in Islamic countries struggling to come to grips with hostile governments, terrorist acts, and an influx of Muslims coming to Christ; you will meet a group of men and women you never knew existed. Acts tells the story of the early Christian church; with an emphasis on the ministry of the twelve Apostles and an inside look about persecution of Paul of Tarsus. A documentary on the work of the Holy Spirit to gather Israel and the Christian church, through the spreading of the gospel of Jesus. A true story about an American couple living among headhunters and cannibals who valued treachery through "fattening" victims with friendship before the slaughter. Peace Child will inspire a new generation of readers who need to hear this unforgettable story and the lessons it teaches us about communicating Christ in a meaningful way to those around us. A fictional book that paints a picture of the harsh reality of oppression and spiritual darkness that exists in the lives of North Koreans today. Learn more about this book on the Freedom for North Korea website, order your copy online today. YOU CAN POST THE TITLES, ARTHURS NAME AND PUBLISHING CO. HERE!